The Coastal Pirates began their quest for a three-peat Sunday in the “climate controlled” facilities of GoodSports USA. The game was slightly delayed because Brain Schlueter was frying some eggs off the center ice tiles, but by the time the rink had pre-heated to 350° we were ready to roll. The Pirates had nine in the line-up for the first regular-season game of the Summer season. (Our Conn Smythe winner Ralz was vacationing — most likely Disney World — after winning the Title.) This is a slightly-different crew from the Spring as Gucci and Wildman have exercised their “one season off” options and have been replaced by Kevin Murphy and Mike “21-23” Farrell. 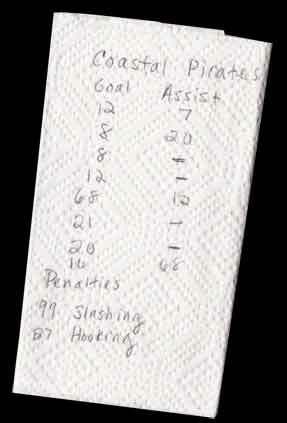 The Pirates played with six up front: Tony-Murf-Dan DiPierro and LeMatty-Brooks-Farkas; manning the blueline was the trio of Russ-Mike-Kevin. Chris Goione, who has been cleared by the team doctors and is now 100% ready to play, was in attendance to root on the team. A broken play up ice in the opening :45 seconds gave the Jags a quick breakaway goal and the 1-0 lead early in the 1st period. After that however, the Pirate rattled-off six unanswered goals that spanned the next 35:00 minutes (see below for scoring breakdown). With 8:00-minutes remaining — after a seemingly-endless barrage of shots and rebounds — the Jags goalie had enough “climate controlled” environment for one evening and left the rink physically exhausted. He was replaced by the goalie for the next game who warmed-up just in time to see Dan DiPierro turn into Brett Hull. On Dan's shot, he blasted one from outside the circle that I believe may still be traveling through Monmouth County somewhere. With less than 2:00 minutes remaining (and the comfortable 7-1 lead) the Pirates relaxed a bit and gave up two late goals. On the first one Scott LeMatty came back to help out on defense, but we got caught up with each other (after the game he said he was surprised I just didn't push him down out of the way — yeah, right!). Scott made up for the snafu a minute later when he skated down on a last-second 2-on-0 with Farkas and shuffled-off a picture perfect pass to Glenn for the slam dunk goal with time expiring. All-in-all, a dominant win that showcased some pretty passing, solid defense and the melted remains of the Jags' goalies. For his 3-point night and the GWG. (This skull is also payment-in-advance for Brooks getting a photo of No.2-draft pick James van Riemsdyk, of Middletown, wearing a Coastal Pirates hat and holding-up one of our jerseys). For his 2 goals (with some nice footwork).